In this technique class we will make amazing kaleidoscope blocks using bold, colorful fabrics and the Stack - n - Whack 45 degree Triangle Tool. This tool cuts wedge-shaped triangles that have a 45 degree angle at the tip and 67- 1/2 degree angles at the two wide corners. This versatile triangle is difficult to cut with a standard ruler, but you can cut it quickly and accurately with the 45 degree Angle Tool! 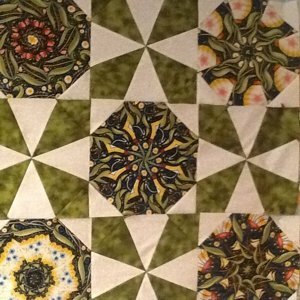 Paula has used the "Stack-n-Whack" technique and patterns in many quilts and loves teaching this technique to others!